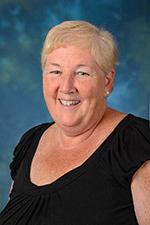 Martha "Marty" Desmond has been named the chairperson of the Nursing Department at Hudson Valley Community College. Desmond earned a B.S. in nursing from Molloy College, and a M.S. in nursing as well as a post-master certificate as a clinical nurse specialist and acute care nurse practitioner from Sage Graduate School. She is pursuing a doctorate in nursing science from Sage, which she expects to complete this winter. Desmond has 37 years of experience as a registered nurse. She joined the Hudson Valley faculty in 2008 and most recently served as the interim department chair. In 2015, she earned a Merit Award for her dedication and commitment to the Nursing curriculum with a focus on simulation and critical thinking. She succeeds acting department chairperson Patricia Klimkewicz, and previously, Carol Bosco, who now serves as dean of the college's School of Health Sciences. Desmond is a member of many professional organizations, including Sigma Theta Tau, the American Association of Critical Care Nurses and the Northeastern New York Professional Nurses Organization, which she served as director-at-large. The college's Nursing program annually graduates more than 70 students who go on to careers at medical facilities and physician offices around the region. It is one of the original allied health programs offered at the college and recently celebrated the 50th anniversary of its first graduating class.